This is a sad note on which to start a blog, but it’s probably what motivated me to set this up now. 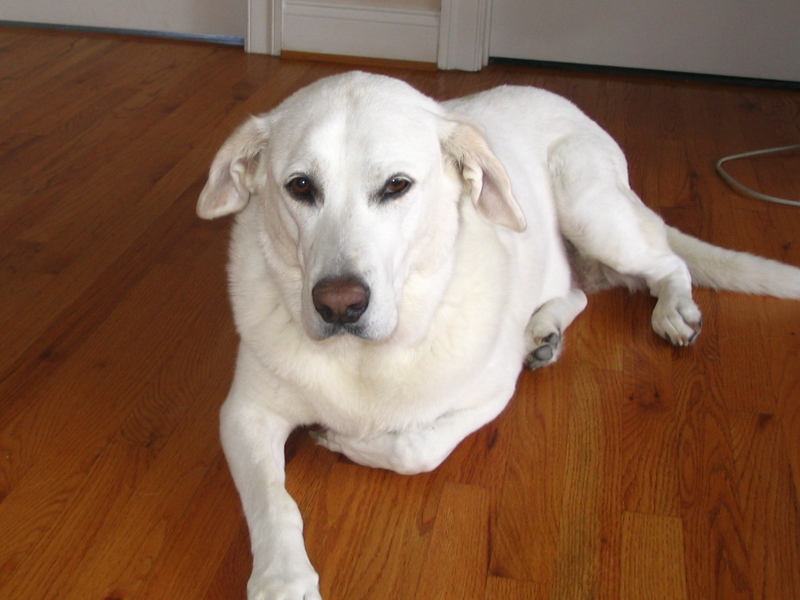 Today, we put down our sweet and gentle dog, Abby, who had been a member of our family for almost 10 years. I can think of no better way to honor her than to describe the day we got her. I’ll say goodbye by memorializing how we said hello. It was the summer of 2000, and we had just moved from Reston, with a small lot, to Purcellville, with a much larger one. We had discussed getting a dog now that we had plenty of room for one, but we hadn’t yet moved toward that goal. Shortly after we moved into the new house, I returned to the Unitarian Universalist Church in Reston for a Sunday service with my son Carl, then 5. (Our older son, Thomas, was away at camp.) A young woman stood up during the service and explained that because of a recent divorce and financial difficulties, she was moving to an apartment that didn’t allow pets. She had a friendly white lab, 2 or 3 years old, that she needed a good home for, and she thought a UU church was a good place to find one. Several people approached her after the service, but it was hard to compete with me — the guy with extra land and a cute 5-year-old. When I pulled into the garage, I opened the side door and allowed Abby to walk in first. Carol was there in the kitchen and the first words out of her mouth were: “I was afraid that’s what it was.” Then almost immediately she added: “What a beautiful dog!” And the two of them have been closely bound ever since.